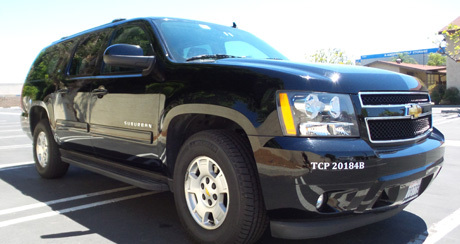 The SUV Suburban is a go to for any family or business transportation situation. With enough room for six passengers, you’ll be able to fit loved ones or esteemed colleges on whatever journey you take. 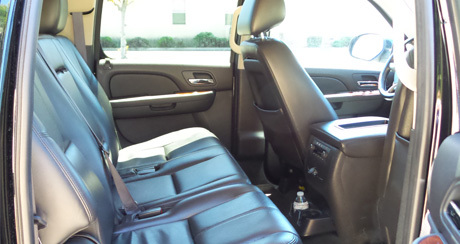 With lush leather seats, room to spare, elevated position, and refreshing air conditioning, you’ll forget you were even traveling as you enjoy your time in this luxurious vehicle. Pop in some tunes to the advanced sound system, complete with CD and Auxiliary cord capability so you can listen to whatever you like, whether it’s playing on the radio or on your phone. You’ll find you don’t have to dig deep to afford this sensible, affordable vehicle to take you wherever you need to go. With the limousine style tinted windows, you can rest easy knowing that you’re safe from prying eyes, and able to relax within your private vehicle. The Suburban is perfect for mobile business meetings, allowing partners traveling together to have a comfortable atmosphere to go over the little details while en route to their meeting. It’s also a great vehicle for families to embrace their time together in a snug environment before an exciting day at a theme park or other destination. With crisp, cold water, ice, cups, and napkins, you’ll be all set to sit back and take a few deep, soothing breathes before arriving at your point of interest. Never settle for warm, cramped, smelly public vehicles such as shuttles or taxi cabs – you deserve to travel with the comfort and ease that an SUV Suburban provides. Don’t worry about asking a friend if you can hitch a ride in their small cramped economy vehicle – travel without a care in ours, and leave the hassle and worry to us. Our professionally trained and insured drivers will ensure that you arrive on time, in style, and as conveniently as possible, and never push or prod you to hurry, or pay more for every precious second. As one of the largest SUVs worldwide, the Suburban can stand up to its name, and fulfills its role as an American icon and an automotive legend. With it’s four wheel drive, anti-lock brakes and auto locking hubs, you’ll not only be traveling around in a stylish and comfortable vehicle, but also have the added benefit of piece of mind that you’ll be safe and protected, especially with precious cargo on board.